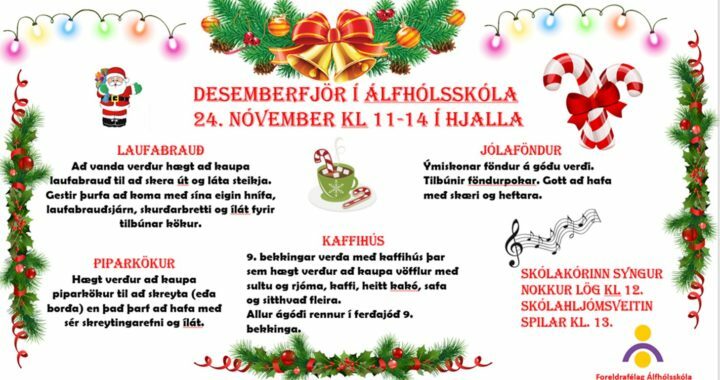 Hið árlega aðventufjör foreldrafélagsins verður laugardaginn 24. nóvember. Húsið opnar kl 11 og opið til kl 14. 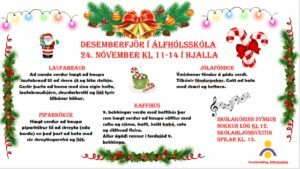 Posi á staðnum og föndur og veitingar seldar á vægu verði – Allur ágóði rennur í ferðasjóð 9. bekkjar. Fyrir þá sem ætla að skreyta piparkökur komi með liti með sér og eins þeir sem ætla að skera út laufabrauð mæti með hnífa, bretti á ílát. The house opens at 11 o’clock andis open until 14 o’clock. The school choir sings at. 12. The school band plays at. 13. Posi on site and cakes and refreshments sold at a low price – All proceeds goes to the 9th grade travel fund. For those who want to decorate gingerbread cakes, bring their colors with them, and those who are going to cut out a piece of cake (laufabrauð) will come with a knife, a pallet and a box.